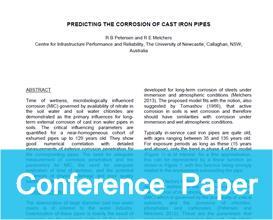 Time of wetness, microbiologically influenced corrosion (MIC) governed by availability of nitrate in the soil water and soil water chlorides are demonstrated as the primary influences for longterm external corrosion of cast iron water pipes in soils. The critical influencing parameters are quantified for a near-homogeneous cohort of exhumed pipes up to 129 years old. They show good numerical correlation with detailed measurements of exterior corrosion penetration for the corresponding pipes. The need for adequate measurement of corrosion penetration and the parameters for MIC, the need for adequate estimation of time of wetness, and the potential influences of physical damage and poor quality backfill are discussed.